Rami Malek gives it his all as Freddie Mercury. For a movie about musicians who are constantly insisting how daring and experimental their work is, Bohemian Rhapsody is disappointingly formulaic and conventional, depicting the life of late Queen frontman Freddie Mercury (Mr. Robot's Rami Malek) as a rise-and-fall-and-comeback narrative familiar from countless music biopics. The filmmakers leave no cliché unturned in their story of how Mercury and his Queen bandmates (who are relegated to fairly minor supporting roles) conquered the rock world in the '70s and '80s, culminating in their landmark 1985 performance at the globally broadcast benefit concert Live Aid. Screenwriter Anthony McCarten and director Bryan Singer (along with uncredited co-director Dexter Fletcher, who took over when Singer was fired late in the production) keep a loose handle on facts and chronology, cramming multiple major events into short periods of time and then glossing over or erasing others in order to craft a feel-good story that panders to its audience of die-hard Queen fans. Given that Queen members Brian May and Roger Taylor are among the movie's producers, it's not surprising that the story shies away from anything complex or truly dark. But even as a celebration of Queen's music, Rhapsody is superficial and unconvincing, functioning only as a collection of mediocre music videos. 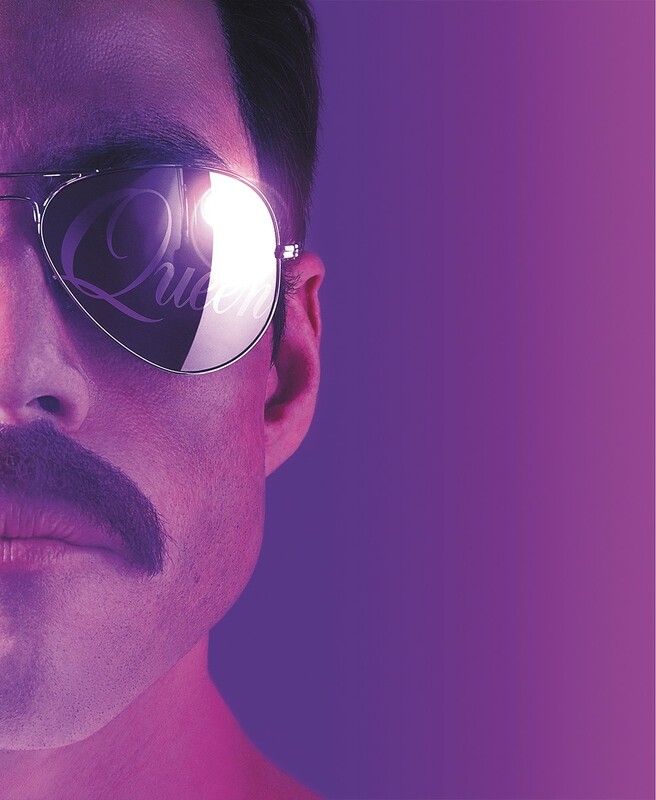 Mercury meets guitarist May (Gwilym Lee) and drummer Taylor (Ben Hardy) on the night their previous band loses its lead singer, and soon he's fronting a new band (which also adds bassist John Deacon, played by Joseph Mazzello), bringing his flamboyant stage presence to the group he dubs Queen. It's a quick montage to get the band from London to touring the world, with a record deal and a high-powered management team. Mercury faces the perils of alcohol and drug abuse (mostly left offscreen), an opportunistic manager who encourages him to split from the band, and a struggle to come to terms with his sexuality, remaining devoted to one-time fiancée Mary Austin (Lucy Boynton) even as he admits to her that he's gay. All of these serious issues (even Mercury's eventual AIDS diagnosis) get perfunctory treatment on the way to the next triumphant moment, and the dialogue is just as blunt and heavy handed, whether it's dealing with Mercury's troubles or with the band's songwriting process. Mike Myers shows up as a disapproving record executive who warns the band members against releasing the song that gives the movie its title, assuring them that no one will ever nod their head to such a strange, challenging composition. It's a groan-inducing reference to Myers' famous Wayne's World scene of headbanging to that very song, and the sequence portraying the song's recording process is so cartoonish that the filmmakers might as well have just plugged in the Wayne's World clip instead. Myers may be the movie's most ridiculous presence, in his mutton chops and tightly curled orange hair, but nearly everyone in the cast looks like they're awkwardly playing dress-up, in bad wigs and ill-fitting costumes. Malek's performance is fine, with a few genuine moments that offer insight into Mercury's loneliness, but he never seems to get used to the prosthetic teeth he's wearing to approximate Mercury's famous overbite. The special effects are just as chintzy as the costumes, with the band playing in front of hordes of obviously computer-generated fans. The original print version of this article was headlined "Tribute Act"